The sensor can track salt, glucose, and alcohol, so you can obsess over every bite. Is Fitbit not accurate enough for you? Apple Watch simply not invasive enough? Maybe a wearable stuck to your tooth would be more your style. Researchers at Tufts University have created just that. 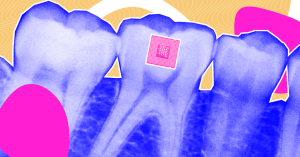 They’ve engineered a tooth-mounted sensor that tracks your every bite (and what it contains). Such a device could be useful, but it could also exacerbate our already-problematic relationship with food. With such a simple and inexpensive design, the sensor could be made widely available. That could be a huge boon to researchers who need a cheap way to track nutrients in a study, or to people who want to get their diet in check and for whom expensive fitness trackers are out of reach, or just don’t cut it. After all, let’s face it, we’re terrible at remembering what we ate, and how much of it. But a tracker like this one could also have some negative side effects. Indeed, one 2017 study found that fitness tracking devices in general were associated with eating disorder symptoms among college students (though, strangely, the same didn’t hold true for calorie counting apps). Unfortunately, there’s a considerable lack of clinical research on their broader impact. How would a sensor that takes away the most labor-intensive part of fitness tracking — data entry — fit into that trend? To paint with a broad brush, modern culture already has an unhealthy obsession with appearance and body type. A tooth-mounted sensor probably wouldn’t give people eating disorders; these medical conditions are much more complex than that. But it could potentially worsen the symptoms of people who already have these disorders, and make it much easier for others to forget that eating sometimes isn’t just about calories and nutrients — it’s also something that can bring cultural understanding and, you know, joy.